By Benjamin BrayfieldLeaders from 11 Native American tribes from South Dakota to Oklahoma walked out of a meeting with federal officials in Rapid City on Thursday to protest the proposed Keystone XL pipeline. They then issued a direct challenge to President Obama: Talk to us directly or not at all. 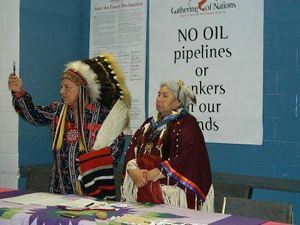 The meeting was arranged amid mounting tension in Indian Country about the pipeline, which would pump oil from Canadian tar sands to Texas refineries. Although the pipeline would not go directly through any Native American reservation, tribes in proximity to its proposed path say it will encroach on their traditional lands and that the project is fraught with environmental risks. To help ease those concerns, representatives from the Department of State, which is deciding whether to approve the pipeline, agreed to meet with tribal leaders on Thursday morning in the Hilton Garden Inn in Rapid City. But before the talks could begin, tribal leaders walked out, upset that the government had sent what they considered low-level officials. In a press conference held by the tribes after the walkout, leaders took turns issuing angry statements against the project and the Obama administration. By Jacob DevaneyThe State Department, still with "egg on its face" from its statement that Keystone XL would have little impact on climate change, sunk a little lower today as the most respected elders, and chiefs of 10 sovereign nations turned their backs on State Department representatives and walked out during a meeting. The meeting, which was a failed attempt at a "nation to nation" tribal consultation concerning the Keystone XL Pipeline neglected to address any legitimate concerns being raised by First Nations Leaders (or leading scientific experts for that matter). Climate Science Watch, The EPA and most people with common sense rebuked the State Department's initial report and today First Nations sent a very clear message to President Obama and the world concerning the future fate of their land regarding Keystone XL.Comment: I don't know how realistic it is to expect a face-to-face meeting with President Obama. But it certainly sends a message about how seriously tribes take the pipeline. And were the tribes surprised by the "low-level officials" who attended? Wasn't the meeting and its participants arranged in advance with everyone's consent? So the walkout may have been more of a publicity stunt than a genuine reaction to the event. If so, it was a good one, earning the tribes some press. For more on the Keystone XL pipeline, see Natives Keep Protesting Keystone XL Pipeline and TransCanada Sponsors Powwow, Awards.